Your personal data and privacy may have been compromised due to Facebook's third-party data sharing. According to news outlets, the data of roughly 70 million U.S. Facebook users was collected in or about 2014 for the purpose of psychographic profiling. Rather than asking Facebook members for permission to access their data, an enterprise paid by Cambridge Analytica accessed all this data through the targets’ Facebook friends. Hagens Berman is investigating the matter on behalf of Facebook users, due to the widespread breach of privacy and personal information. The firm believes that Facebook members who used an app called "This is my digital life" (also referred to as "thisismydigitallife"), and tens of millions of friends of those who used the app, were targeted. In 2014, Cambridge Analytica, a political data firm, got data on Facebook users from Cambridge University researcher Aleksandr Kogan. Facebook members were asked to take a quiz and to use the “thisismydigitallife” app. When users did as they were asked, data that their friends had allowed them to see were gathered by Kogan’s company and sold to Cambridge Analytica, just as Cambridge Analytica had planned. Despite its admissions that such access and transfer violated its privacy policies, news reports indicate that Facebook did not step in to stop this gathering and transfer. Data acquired included details on users’ identities, friend networks, email addresses, users' locations, "likes," and other data provided to Facebook by its users. News reports indicate that at least some of the data is still available on the web. Hagens Berman believes that Facebook breached its duty to its users to protect their data and failed to act in ways that were ethical, transparent, and in the best interest of Facebook's users. We believe Facebook users suffered violation of their rights in this massive data-harvesting scheme from parties taking advantage of Facebook's lax data protection. Hagens Berman is one of the most successful consumer litigation law firms in the U.S. and has achieved more than $260 billion in settlements for consumers in lawsuits against major corporations, automakers, big banks and others. Your claim will be handled by attorneys experienced in consumer law. The Judicial Panel on Multidistrict Litigation has consolidated the federal cases against Facebook before Judge Vince Chhabria in a Multidistrict Litigation (MDL) proceeding, as is common of cases this size. The parties are filing initial case management statements, and the first case management conference will be on July 18, 2018. During this discussion, leadership for the case and other topics will be addressed in order to move forward with the claims of the proposed class. On Apr. 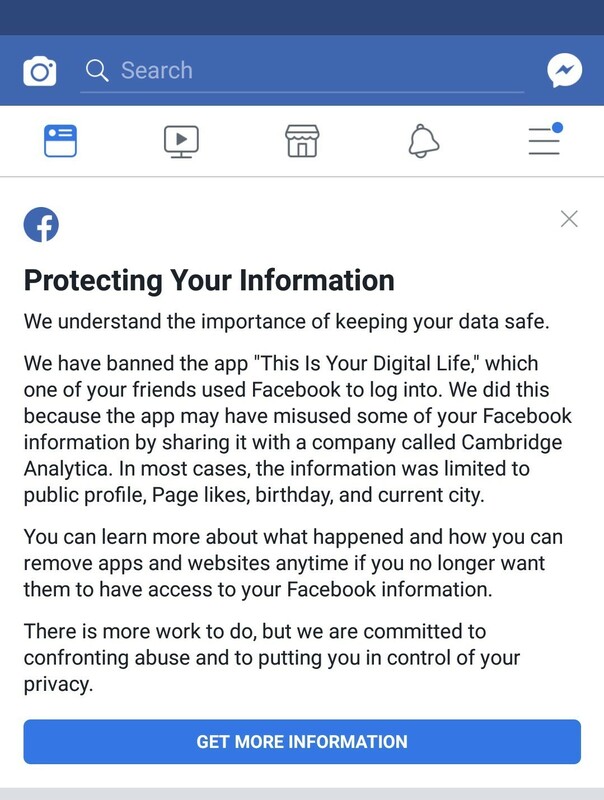 9, 2018, Facebook began notifying Facebook users of whether their data may been transferred to Cambridge Analytica. If you have received the following message or something similar from Facebook, you may be affected. If so, and if you’d like to join this case, please fill out the form on this page.